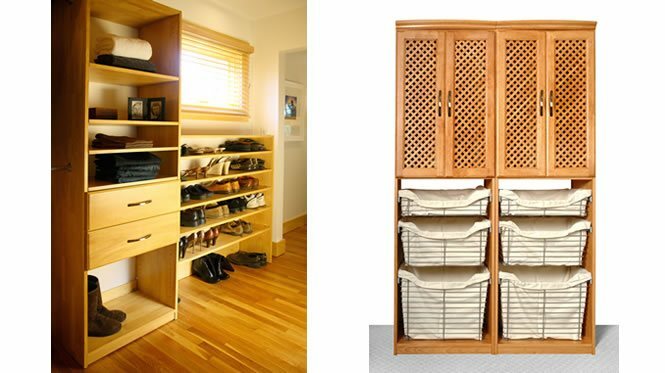 See solidwoodclosets.com closet systems and organizers featured on DIY Network show "Dream House". ?The main factors for choosing Solid Wood Closets, Inc. was they wanted quality materials, eco-friendly green products, lots of organization options, and furniture-like closet systems, that offered DIY installation. 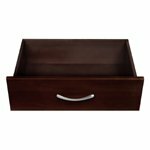 Our closet organizers is made with 3/4" thick real solid wood, full panels (not ventilated); we only use the finest quality cut solid hardwood available, then we use state of the art wood paneling process, cut, smooth and hand stain every piece, and use multi layer finish process to furniture-quality. We only use quality 1" diameter steel metal hanger rods and flanges, refined in Brushed Nickel to add to the elegance and beauty of our solid wood closet organizer systems, and to prevent sagging. Heavy-duty metal brackets and connectors ensure stability. Our solid wood closet organizer systems is floor standing (not wall hanging), which makes it very stable, secure, and very easy to install. A baseboard clearance built into the design of the floor standing vertical tower so you do not have to remove or cut your existing baseboard. Flexible and modular closet systems design that can be configured and installed in a variety of ways to fit your desired look and custom closet organization needs. With do-it-yourself easy installation, our closet organizer systems can fit a closet space up to 10' wide, and can be reduced and expanded in size with a variety of closet accessories that are available to enhance the look and functionality of your custom closet organization and closet storage needs. Additionally, we offer a variety of high-end, functional, Closet Hardware accessories for the DIY closet systems, like, Baskets, Hamper, Tie Rack, Belt Rack, Pants Rack, Closet Valet, and more. All of our Closet Hardware accessories are finished in Nickel, to compliment the elegant look of our closet organizers. You do not need any carpentry skills to install your custom solid wood closet organizers; only basic tool skill is needed. Our flexible, modular, and simple design makes our closet storage systems very easy to install. Quality workmanship ensures years of use, and closet organization and storage solution. When you decide to move, you can take it with you, or leave it to add value to your home. Whether you are looking for Reach In closet Organizers, or Walk In closet Organizers, our closet systems can accommodate both. The difference is the closet organizer depth; reach in closet organizer system is 12" in depth, and the walk in closet organizer system is 16" in depth. Three beautiful colors are available to choose from that can blend in with any home decor: Maple Spice, Cherry, and Espresso. We use multi layer hand staining and finishing process to present; luxurious, furniture-quality high-end closet organizers that will stay elegant and beautiful after years of use. Excellent and very responsive customer support team that is ready to answer any product or design question, and guide you through the installation process. Our shipping department can pack and ship your closet order anywhere, no matter how small or large your order is, it will arrive safely. That is why our closet systems is elegant, beautiful, and they are in a class of their own. 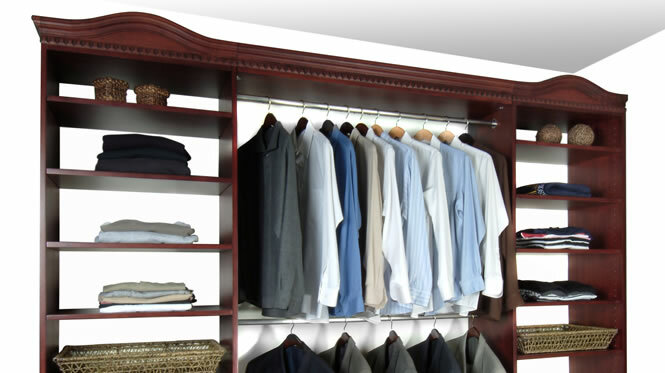 You could spend hundreds, even thousands more on inferior products, but nothing comes close to the beauty and quality of our solid wood closet organizer systems. All Closet Organizer Systems were NOT created equal, and no other closet organizer company can offer all this at our low prices. Buyers until recently have had limited choices on closet organization and storage solutions. Choices included the franchised closet companies (online and local), big box home centers, or custom cabinet and closet makers. 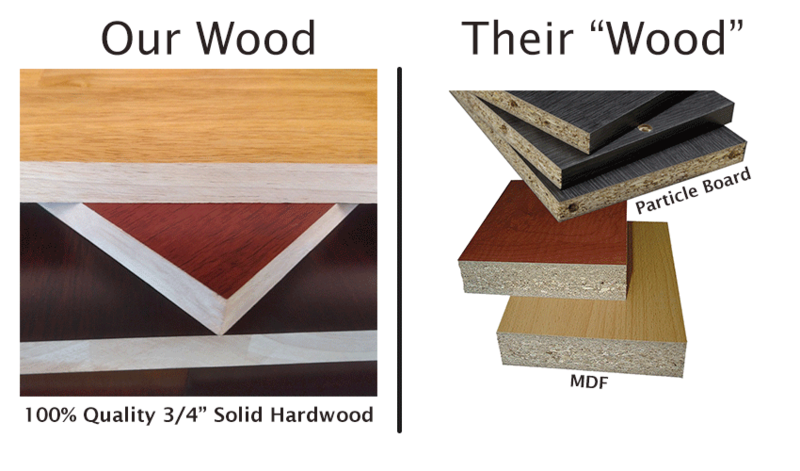 Closet companies use pressboards, MDF, particle boards, plywood, melamine and wood veneer; yet do not offer pricing consistent with these low end materials. Home centers have lower prices and the same inferior materials with very limited support, and practically little or no design assistance. With a high-end custom cabinet and closet maker, a buyer will most likely get quality wood products but at a significant costs weighing on ones budget. Our closet organizer systems is different. 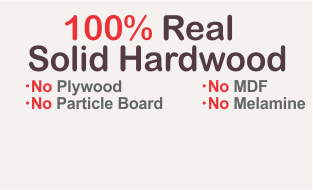 We offer you Formaldehyde free, full panel (not ventilated), furniture-quality, modular, floor standing, eco-friendly, 100-percent real solid hardwood closet organizer systems at a reasonable price. That is why no one else can offer you what we can, NO ONE. Simple to use online closet design tool is available to anyone who wants to design and price our closet systems. It is very easy to use, and you can create and price your dream closet in minutes. 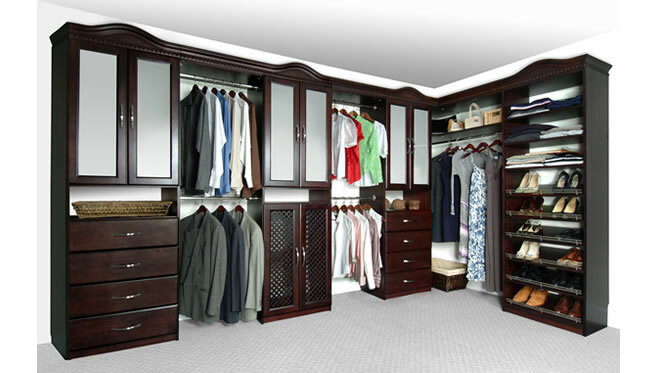 We also offer walk in closet design and installation service in the greater Los Angeles and surrounding counties. Whether you are looking for closet design or installation help, our professional designers and installers are ready to help, by phone, email, or fax. Just contact us and we will be happy to help. By offering quality eco-friendly, real solid hardwood, closet organization systems to homebuyers and your clients, you can increase your credibility and appeal. Developers and builders who are looking for a little extra edge over competing home sellers can offer our quality closet shelving systems as an inexpensive incentive to prospective home buyers.